We at Highest Degree Ent. cant think of a better way to celebrate Halloween than with a gigantic bonfire in the middle of the desert. Located at a prime spot in Sycamore Creek, we'll have ready for you the best night of your life. If you have four wheeler's, dirt bikes, lifted jeeps, or big trucks, bring em out!! To access the campsite you will NEED 4 wheel drive, don't get stuck!! (There will be a $5 fee per person for transport to the campsite, lock in your ride with a pre-sale ticket today!) 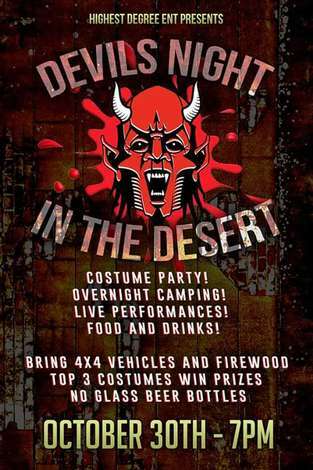 This will be the biggest costume party of your life, grab your outfit and get ready for Devils night out! In addition to a giant costume party, we'll be providing great food and drinks, along side a diverse line up of live entertainment from around the valley. Get your camping gear together because this is an ALL NIGHT event! This location can get extremely cold at night so bring proper attire!